Steak topped with a delicious Manchego mushroom sauce is the perfect meal to pair with a good Spanish red wine from Navarra. Make the rub: combine the teaspoon of salt, garlic powder and 1/2 teaspoon of thyme in a bowl. Pat the steak dry. Sprinkle half the spice mix onto one side of the steak, and rub it into the meat. Turn over and repeat on the other side of the steak. Set aside so the steak can absorb the rub. Start making the mushroom sauce. Heat the olive oil in a sauce pan on medium. Add the shallot, and cook for a few minutes until the shallots soften. Add the mushrooms to the shallots, and add salt and pepper to taste. Cook until the mushrooms start to “sweat”, about 5 minutes. Stir the red wine into the mushrooms. Add the thyme and paprika. Cook until the wine is mostly absorbed. Finish the sauce by adding the butter and cheese to the sauce, stirring as as the cheese melts. Keep warm as you finish cooking the steak. Start cooking the steak around the time you add the mushrooms to the sauce. Heat an oven proof skillet on medium high, and coat with oil spray. When the pan is hot add the steak. Sear the steak on one side for a minute, then turn to sear for a minute on the other side. Move the steak to the oven. Roast for 12 to 12 minutes for medium rare. When done to your liking, remove steak from oven. Let the steak rest for a few minutes. Slice the steak and plate a portion, topped with the mushroom sauce. Enjoy! Using a mixture of mushrooms adds robust flavor. 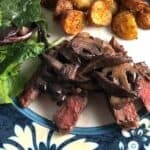 I used a combination of shiitake and oyster mushrooms, but you can vary based on what you have available. You could reduce the salt in the rub to 1/2 tsp and increase the other herbs a bit if you are managing your sodium content.